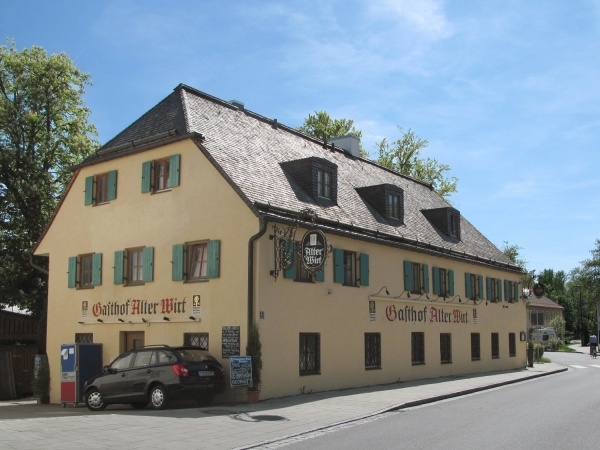 The Alter Wirt beer garden exists since over 160 years and is located along the small river Würm in Krailling just south of Munich. After some difficult years the Augustiner brewery took over the management of the restaurant and beer garden. Following restoration work and improvements of the catering, the people of Krailling began to appreciate the effort by their regular visits. The self-service area has about 250 seats, shaded by a combination of large sun umbrellas and chestnut trees. A Maß Augustiner costs €6.60 (July 2016). During Happy Hour on weekdays until 5pm, the Maß costs only €5.50 (July 2016). The beer garden is open seasonally from March until November. The beer and food stalls in the self service area are open weekdays between 5pm and 10.30pm. Before then, the beer can be fetched from inside the restaurant building. On Saturdays, Sundays and public holidays, the beer and food stalls open at 10am.